For any web developer, it is almost mandatory to know how to create horizontal or vertical menu bar using HTML and CSS. Menu bar helps to categorize contents and increases the website readability. In this article, we will discuss how to create horizontal menu bar using HTML/CSS step by step and in the next article, how to create vertical menu bar using HTML/CSS. This is the simplest way to create css dropdown menu bar but best for new web developer. To get more interactive menu bar, you could use JQuery, HTML 5 and CSS3. To write the script, you could use any html css editor software but don’t forget to save the file with .HTML extension. Here I have used Notepad++ to write the script. Step 1: Open any HTML editor and write HTML script in ul-li order without any CSS script and save the file with .html extension. Now if you open this html page in any browser, it looks like below, without any formatting. Next we will add CSS script to organize menus horizontally. 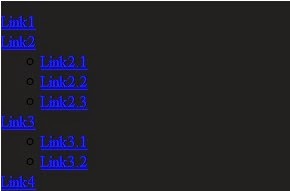 Step 2: Here we will write CSS script inside html file. This type of css script is called internal css and another one is external. In external css, we write script in a separate file, save it as .css and include that file in the html page. The benefit of using external css is reusability, one css file can be used for more than one webpage. To make it simple, we have added internal CSS. To add internal css, create a ‘Style’ tag under HEAD section of HTML and write the css script inside <style> block. First we shall add few basic css tags to set width, height, background color. Step 3: Now add curve corner to give it a beautiful looks. To do this, use css command border-radius. set it to 50px. It looks better, right! well, once we complete css script, it will look good. Step 4: Now give a nice floating looks where all ‘li’ elements will be in one line and all ‘ul’ elements will be below that line. Step 7: Now add two css blocks for ‘ul’ items. First block will hide all ‘ul’ items, also set display properties like color, padding, position. Second block is to display all ‘ul’ items once we hover the ‘li’ items. That’s all. We have successfully created the horizontal CSS menu bar. Now we will add few more lines to give our css menu bar more professional look. Isn’t it nice!!! simple to create but great in looks. We could add many more properties to give it more professional looks. But as it is our first horizontal menu bar, don’t want to make it complex. We will discuss all other properties in subsequent articles. If you have any doubt or question, feel free to ask us. To get more updates on recent activities, follow ‘TechOneStop’ on Facebook/Twitter/LinkedIn or join our website as followers. Nice information about the menubars code in one place..